One Week Only: Winter Reds Half Case Special – 30% Discount – EXTENDED! 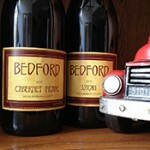 Purchase 6 or more bottles of any of our four reds for a 30% discount! Sale HAS BEEN EXTENDED TO DEC. 20th. And to make gift giving a little easier, we have put together specially priced two bottle and three bottle gift packs for the holidays. Up to 30% off! See Shop Online for details. You are currently browsing the Bedford Winery blog archives for December, 2015.